I was asked to elaborate on the resurrection and the place and actions of Jesus and the Christ. There is a principle that you can not comprehend the higher without taking in the lower. Thus to ascend above all things Jesus descended and visited those of lowest vibration in the spirit world and then worked his way up to the highest entities in that invisible world. After he made this round the time had come to return to the body. The reason he waited three days is because it was the Jewish belief that it was impossible to raise the dead after there was no heartbeat for three days. Reviving the body after three days was an impossible feat according to the authorities of that time. The disciple Jesus went through these experiences while the Christ was still linked to him while in deep meditation. The stone that covered the tomb was removed by several associate Masters who came to greet and assist the resurrected Jesus. Jesus could have walked through the stone, but its removal was a strong sign that a miracle had happened. Finally Peter asks a question that (What is the resurrection?) could take several long posts to answer, but I will say a few things. There are several degrees of resurrection. The lowest degree is through the principle of rebirth. This is called the resurrection of KRISIS (in the Greek) in the Bible. The second is a renewal of the body, but after the body is renewed it will continue to age normally. This happened to Moses and Abraham in the Bible times. Here we are told that the early saints knew of a “better resurrection” and that they were willing to go through great sacrifice in hope of achieving it. In this better resurrection spirit and matter reach a point of balance to the degree that the Master can renew his body indefinitely or reproduce any form from past lives. After this resurrection the person is as immortal as He wants to be. Nevertheless, the power of decision to become is still His and He still has the power to chose death and return to mortality as one of us for some work of service. The Ancient of Days became mortal after a long period of immortality. He did this when he became the first Adam or self-conscious man. The group has been bringing up unusual teachings presented on the internet. The question that many ask is how do we know if any particular teaching has any truth behind it. Are there nine initiations or twelve? Are there seven chakras or 18? Are we being transformed into the 5th dimension, 24th or are we just slowly evolving in the current dimension? Do we need to follow guru A, B or C to save us from the earth changes, nasty aliens or whatever? Is Zor coming with his spaceship or not? From the beginning I have taught you to look for the principles. Therefore, I ask: How do we discover the truth of a certain presentation? 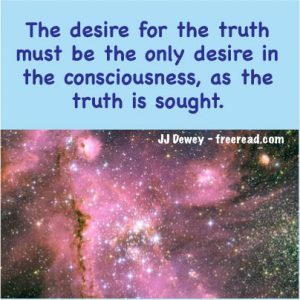 What are the principles we look for to discern truth from fiction in the many channelings and teachings presented to us? In the past a medium could channel a savvy entity and he or she would be lucky to gather twenty followers in the local community. Now if the person can come up with interesting material he can post it on the net and gather worldwide interest in a short period of time. This has the benefit of creating opportunity for both teachers and seekers, but it also has the negative aspect of making many people’s heads spin when they surf from one site to another and find many diverse, but conflicting doctrines vying for attention. There are many good-hearted people who examine conflicting teachings, like them both, and try to find unifying threads. Once these unifying threads, real or imagined, are seen many come to the conclusion that they are all inspired. This seems like a good thing to do, but many do no realize that the acceptance of conflicting thoughts causes a scattering of the attention making it seem that the point of contact with the soul is everywhere rather than the single point between spirit and matter. It is much better to follow one teacher, or system of teaching, that has only a little truth than to follow twelve systems that have a combination of much truth, yet contradict each other. Because in harmonizing contradictions you have neutralized your discernment and when discernment is neutralized little or no truth is seen no matter what the quantity or clarity of presentation. By examining one teaching at a time one can test and reflect that teaching off his soul and incorporate those in harmony with the God within. These harmonious truths then provide a foundation built on rock as a means of testing the next philosophy he encounters. Many of you will remember the list we created detailing the qualities of the disciple and found this helpful. Now we are going to make another list in answer to the following: What are the principles or steps we should follow in recognizing the truth of a teaching? This should be answered from the vantage point of the average seeker. In other words, telling the average guy to go directly to the Monad and do not pass go would be meaningless to him. Several of you have correctly stated that we should seek soul contact and trust it, but the trouble is that seekers are in many points on the Path, as far as contact is concerned, so this advice cannot apply to all. For instance, many are seeking soul contact, but have not yet achieved it in a way they can recognize. Others have achieved glimpses of it several times, but are not familiar enough with it to avoid deception. Then there are those who believe they have soul contact, but in reality have astral contact, not realizing that astral trust veils the soul. Finally there are those who have true soul contact. They know who there are and know that they know. Now if I were to teach you about 144 dimensions and tell you to use your soul contact to verify this, the above four groups would give, many different answers. Hopefully we can see from this point that just telling you to use soul contact is not enough to bring a mixed group to oneness in the truth. A group composed of individuals all having soul contact can be extremely unified, but such a group is not our luxury at present. Many are struggling to know correct principles and this list we are creating must be for them. We will create this list without regard to the order of importance and rearrange later if necessary.